Welcome to those of you joining me from The CanaDisney Blog and those of you just hopping aboard. I am the 3rd, stop on our Magical Blogorail. 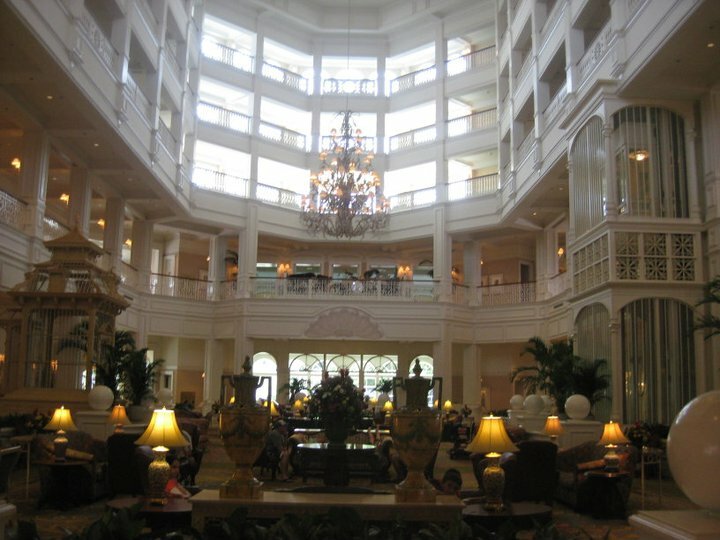 Disney's Grand Floridian Resort and Spa opened up in 1988, as the first in a line of resorts that then Disney CEO Michael Eisner created to attract visitors to spend more time and money on Walt Disney property instead of the local area hotels. Other Magic Kingdom area resorts were originally inspired by the lands of the Magic Kingdom the Contemporary to be seen from Tomorrowland and the Polynesian from Adventureland, the Grand Floridian is tied to Main Street, U.S.A. The hotel and grounds are inspired by the Victorian era houses on the east coast of Florida in the late 19th and early 20th century, the time perfectly ties into Main Street, U.S.A. The main building I remember vividly growing up thanks to a wonderful episode of Full House (c'mon - who doesn't remember Uncle Jesse sitting down at the lobby grand piano to serenade Aunt Becky when he missed their anniversary picnic? ), even more than the first time I stayed at the resort, in 1993. 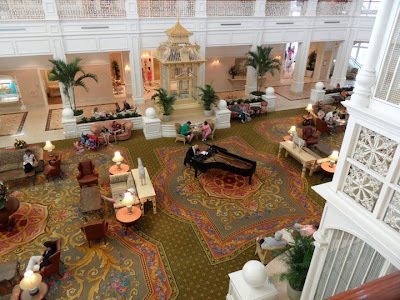 During the evenings, and maybe during the day - I'm not sure of their specific times - there are piano players, playing classically arranged Disney music and other beautiful melodies to float through the beautifully ornate lobby. When the piano players aren't working, the Grand Floridian Society Orchestra The inside of the Main Building is reserved for concierge guests, and while it's lovely and a great (yet most likely insanely expensive) option, I've actually heard guests complain that it's very loud, as it's an open atrium in which the majority of guests go through regularly to make their way back to their rooms. The first views walking in from the parking lot or Magical Express bus include the beautiful atrium lobby, but also stunning marble displays with many hidden characters on the grounds and even in the carpets. Even the resort rooms are filled with Disney details. The wallpaper, paintings, desks, and lamps are covered with our favorite pals. 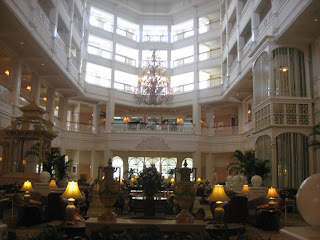 At the bottom of this post, you can find my links to more of the decorations you can find when staying, or perusing, this beautiful resort! The Grand Floridian is the flagship resort for Walt Disney World, and with that, it is the most expensive resort on property. The Disney Vacation Club is currently building a resort there, near the Wedding Pavilion. If you're looking for a wonderful spa, this is the location.. or would be if it weren't currently closed for the building of the DVC properties! And, while this resort is fancy schmancy, my memories include watching Hulk Hogan film his short lived show, Thunder in Paradise 1993, and the memories my family and I made staying there last June. My son had a blast in the pool, splash areas, and making friends with the cast members! Plus, instead of the standard pack 'n' play, they had a real crib for him to sleep in! Thank you for joining me today. Your next stop on the Magical Blogorail Loop is The Disney Point. We actually were in Disney the year they were building it. I remember riding the monorail past the construction and they had a huge billboard up of what it was going to look like. I think this resort is absolutely beautiful! We haven't stayed there yet, but it is on my to do list for one of our future trips! My first visit to Disney was in 1988. I don't remember Disney without the Grand Floridian. It certainly is a beautiful resort. We've never actually stayed there, but we do spend a lot of time visiting when we are there! My favorite hotel to visit for Chrsitmas decorations. Still not sure if I want to stay there. Love the GF! We stayed in the CL Sugarloaf building. I would go back tomorrow if I could! Great family resort! Just stayed there on Fourth of July Week...Beautiful hotel and wonderful Mousekeeping! We loved the nightly turn down service complete with chocolate pieces. A Grand review! Now how did I miss that edition of Full House? I may have to rent it. Many terrific memories have been made here, and what a place to visit during the Christmas season!! I think they're on Netflix! It's a great episode! May actually be two. Thanks for sharing. I don't know a lot about GF so I really appreciate the time to share. I especially love the Hidden Mickey pages. Guest Post - Know Before You Go: Carsland!